What is the First Folio of William Shakespeare? The first collected edition of plays by William Shakespeare (1564-1616) was published by his former colleagues in a single volume Mr. William Shakespeares Comedies, Histories, & Tragedies (1623), which is commonly called the First Folio of Shakespeare (F1 for short) since it was printed in the prestigious folio format. It was to be printed three more times (1632, 1663 [second immpression, 1664] and in 1685) until the smaller formatted multi-volume editions replaced it from 1709 onwards. Whereas Shakespeare allegedly wrote 39 plays either in sole authourship or in collaboration, John Heminge and Henry Condell, his colleagues and editors, included 36 in the First Folio, of which 18 including such plays as Macbeth and Twelfth Night would have never reached us were it not for the First Folio. The remaining 18 including such plays as Hamlet and A Midsummer Night's Dream were previously printed in quartos. However, according to Mr. Peter W. M. Blayney, only two of them can be described as simply reprinted in the Folio. The First Folio is, therefore, by far the most important edition of the plays of William Shakespeare. 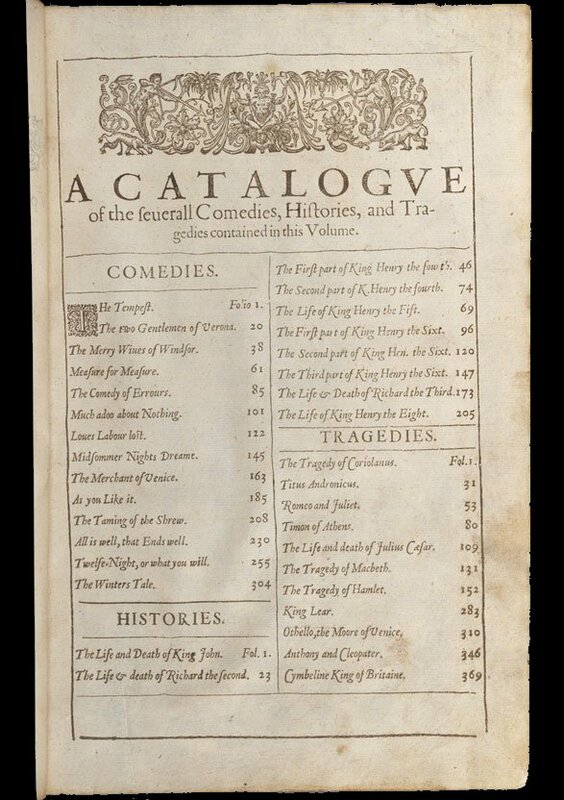 The titles of the plays included in the First Folio are shown in the Catalogue except for Troilus and Cressida. For more information about the First Folio, see, for example, Peter W. M. Blayney, The First Folio of Shakespeare, Folger Library Publications, 1991.